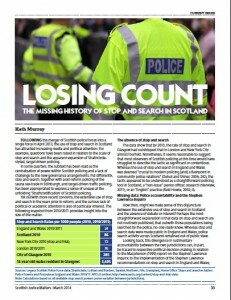 In May 2014, against a backdrop of media and political attention, the Scottish Police Authority published its Scrutiny Review on stop and search. The Review raised several key questions: Does stop and search work? What constitutes a successful outcome? And is the scale of search activity in Scotland justified? The Authority made twelve recommendations in relation to policy and practice, ten of which pertained to Police Scotland. This blog examines the recent Police Scotland response to the Authority. The blog looks at effectiveness, proportionality, the use of non-statutory stop and search and accountability, and identifies areas that might benefit from further consideration. The blog also suggests additional data that could be provided to improve our understanding of stop and search policy and practice. Does stop and search work? However, looking at the Police Scotland response, both points still seem unclear. On the one hand, weight is placed on intelligence and detection, by dint of a target detection rate of 20%. Yet on the other hand, this is offset by high-volume search activity, which in practice is likely to result in lower detection rates. In other words, there is a conflict between the aims of detection and deterrence. The further difficulty here is that both positive and negative searches are viewed as constructive, which makes the tactic difficult to challenge. In terms of impact, the Police Scotland response appears to be at variance with the Authority. Whereas the Authority stated that they could find no robust evidence to support a relationship between search levels and offending, Police Scotland make a link between search rates and offending trends, although this does not appear to be substantiated. Several recommendations touched on proportionality. For example, Police Scotland were asked to ensure that particular communities were not disproportionately impacted; to explain the significant changes in the volume of searches in some areas; and to assess the prioritization of stop and search against other policing activities. In its response, Police Scotland recognized that proportionality can be measured in relation to different factors, including age, ethnicity and local crime rates. Whilst this type of detailed analysis is welcome, it is surprising that no data were provided in the response, particularly in relation to age, which has been raised as a concern by the Children’s Commissioner (for example, age data published earlier this year show that the search rate for sixteen to nineteen year old boys in Greater Glasgow was 2,298 searches per 1,000 boys). Results from the Equality Impact Assessment on stop and search could provide further insights into proportionality. This assessment was underway earlier this year, and is presumably now complete. Also, financial evidence would be helpful. For example, it has been estimated that stop and search activity in the first year of Police Scotland cost over fourteen million, and that negative searches cost over ten million. These figures can help to demonstrate the extent to which stop and search is prioritized over other policing tasks, and might be discussed accordingly. Non-statutory stop and search allows officers to search people without reasonable suspicion, on the basis of verbal agreement. This type of search is not underpinned by legal authority and is arguably the most controversial aspect of Scottish police practice. Non-statutory searches also have a significantly lower detection rate than statutory searches, which raises questions about the extensive use, and purpose of the tactic (approximately seventy per cent of recorded searches are non-statutory). However, informed consent is complex, and extends beyond simple verbal agreement. For example, consent requires the maturity to understand what is being asked, and must be given without duress. Given that children as young as thirteen may be searched on a non-statutory basis, it seems unlikely that informed consent can be secured in such encounters. Indeed, it is arguable that informed consent is untenable in any encounter between uniformed officers and a member of the public. Taking these points into consideration, the recommendations on consent were perhaps overambitious. Public and stakeholder concerns in relation to searching people without legal authority are however, unlikely to dissipate, and this might be identified as an area for further review and consideration by the Authority. Whilst a clear commitment to accountability is made in the Police Scotland response, this could be extended further, particularly towards those outside the policing organization. For example, it is concerning that for the duration of the Authority review, requests for data by journalists were turned down on the grounds that ‘misleading conclusions’ might be drawn by ‘non-expert users. In order to improve transparency and inform debate, statistics on non-statutory stop and search could be made available in Police Scotland Management reports (and by the Authority). Also, it would also be helpful to provide insight into the role and views of the Expert Reference groups appointed by Police Scotland to provide feedback. Otherwise, the impression may be given that the current policy direction has been unanimously endorsed. Since the publication of the Scrutiny Review, it’s clear that progress has been made. For example, Police Scotland have established a National Stop and Search Unit to ensure consistent practice; a Best Practice pilot has been implemented in Fife; and the use of non-statutory stop and search on children aged twelve and under has been abolished. However, there are still unanswered questions and ongoing concerns. For example, both the actual impact on recorded offending, and the appropriate measure of success seem unclear. Stop and search rates remain high, even taking into account the fall in recorded searches in the first quarter of 2014/15, whilst data from the first year of Police Scotland suggest that some young people are subject to disproportionate levels of search activity. This point is important, and raises serious concerns about the longer term effects on police legitimacy. And the thorny issue of non-statutory stop and search remains. In short, the progress made thus far is hugely welcome. However, there is also a demonstrable need for further debate and action. Kath Murray is a PhD researcher at the University of Edinburgh. She recently submitted her doctoral thesis which examines the development of stop and search in Scotland, from the post-war period onwards.